One of the most anticipated releases of the year is the three disc (two CDs and one DVD) set from The Travelling Wilburys. Why? Because for several years you couldn't legitimately buy any Wilbury music. This writer, when he wanted to hear the first album, needed to download an illegal MP3 to do so! The accidental supergroup of the Travelling Wilburys had an equally accidental beginning. George Harrison needed to record a new song for the b-side of a single. His recent producer, Jeff Lynne, was working with Roy Orbison. Harrison's guitar was at Tom Petty's house. Bob Dylan's studio was nearby. So when Harrison was finished the writing of is song, Handle With Care, he included vocal parts for each person. Back in 1988 the head of a record company actually knew more about music than accounting. So it was no surprise when the head of Harrison's record company knew that Handle With Care was far too good for a b-side. Convinced to put together a whole album, the five musicians wrote and sang for a couple of weeks. The result? A number one hit record, selling millions of copies. 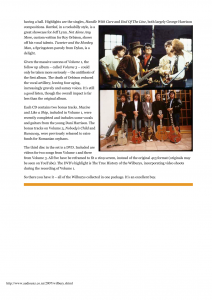 Travelling Wilburys Volume One was an unpretentious album that oozed fun. You could tell that the five musicians (plus session drummer extraordinaire Jim Keltner) were having a ball. Highlights are the singles, Handle With Care and End Of The Line, both largely George Harrison compositions. Rattled, in rockabilly style, is a great showcase for Jeff Lynne. Not Alone Any More, custom written for Roy Orbison, shows off his vocal talents. Tweeter and the Monkey Man, a Springsteen parody from Dylan, is a delight. Given the massive success of Volume 1, the follow up album -- called Volume 3 -- could only be taken more seriously -- the antithesis of the first album. The death of Orbison reduced the vocal artillery, leaving four aging, increasingly gravely and samey voices. It's still a good listen, though the overall impact is far less than the original album. Each CD contains two bonus tracks. Maxine and Like a Ship, included in Volume 1, were recently completed and includes some vocals and guitars from the young Dani Harrison. The bonus tracks on Volume 3, Nobody's Child and Runaway, were previously released to raise funds for Romanian orphans. The third disc in the set is a DVD. Included are videos for two songs from Volume 1 and three from Volume 3. All five have been reframed to fit a 16x9 screen, instead of the original 4x3 format (originals may be seen on YouTube). 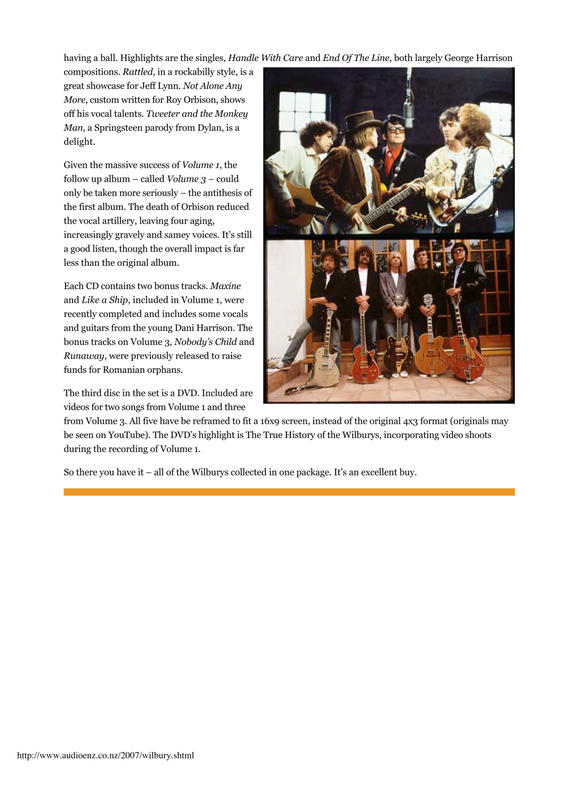 The DVD's highlight is The True History of the Wilburys, incorporating video shoots during the recording of Volume 1. 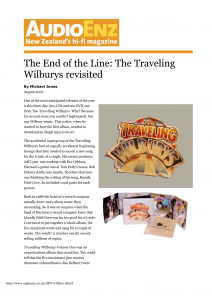 So there you have it -- all of the Wilburys collected in one package. It's an excellent buy.